Who would have known: Gritty and often gorgeous center city Philadelphia has a new moniker — most biakeable downtown. The envelop please. With a Bike Score of 96.4, Center City West in Philadelphia is the most bikeable downtown neighborhood in the U.S.
Here’s what’s pretty cool: City leaders in Philadelphia have worked over recent years to increase the number of bike lanes running through downtown and expand the city’s Indego bike share program. As the bike network grows, safety continues to be a concern as well as an increasing priority for bicyclists and governments in Philadelphia and elsewhere across the country. 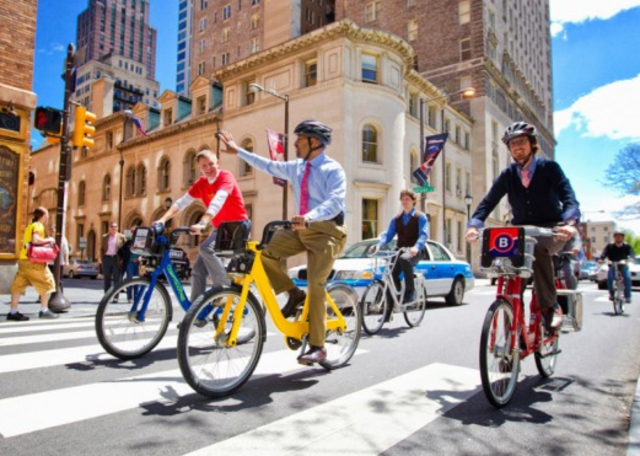 Bike fatalities decreased by 25 percent in Philadelphia from 2010 to 2014, and education has been a big part of that, according to Clarena Tolson, Philadelphia’s Deputy Managing Director for Transportation and Infrastructure. “One of the keys to bicyclist safety has been greater education and appreciation for bicyclists as people who deserve to share the road, so we’ve made that a focus,” said Tolson.